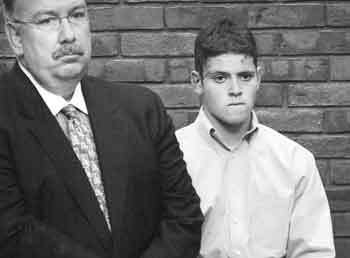 Attorney Stephen Jones, left, represented James Flanagan, 19, of Norwood, at his arraignment on charges of killing two Weymouth girls while drunk in a crash in Norwell in 2003. Flanagan is scheduled for trial this summer. Lawyers who specialize in drunken driving defense say the absence of a sobriety test is advantageous because it’s one less element they have to defend against. But even if defendants take the test, lawyers challenge its reliability. Rough or cracked pavements or a curved line can affect someone’s stability in walking a heel-to-toe line, lawyers say. Lawyers also try to show that people who failed sobriety tests did other things well. “You can look at how a person took his wallet out and removed his license without fumbling, and handed it to an officer, along with his registration, without any problems,” Plymouth attorney Timothy Kelliher said. People who were with a client before the arrest, or who picked him up later at the police station, can sometimes testify that he was not impeded, Kelliher said. Videotapes recorded at police booking desks can sometimes help clients, unless they were falling-down drunk. The absence of blood alcohol evidence also is an advantage, lawyers say. Refusal to take a breath test means an automatic 120-day license suspension for a first-time offender, but the refusal cannot be used in court as evidence against an accused drunken driver. But even if someone has failed a breath test, it is not an insurmountable barrier. “If a knowledgeable challenge is mounted against the breath test, we are quite successful,” said Brockton lawyer Edward Sharkansky. In defending people charged with driving under the influence of alcohol, lawyers will bring in expert witnesses to explain how the machines work, how they must be calibrated and their limits. Breath tests are not infallible, lawyers insist. “We’ve seen them tricked by menthol lozenges and certain chemicals present in cleaning fluids and paint thinners, and the breath of diabetics can trigger the machine,” Jones said. The machines also can be thrown off when a person has a fever or is taking certain medications, he said. It could cost you $10,000 or more, but lawyers who specialize in drunken driving defense say they can help you beat the rap. “Almost any case can be won on one ground or another,” says Stephen Jones, a Norwell lawyer who wrote an 800-page treatise on defending accused drunken drivers as part of the Massachusetts Practice Series. Jones said his firm, Jones and Milligan, successfully tries about 80 percent of the 200 drunken driving cases it deals with annually. For the last four years, millions of federal dollars that could have been used for road repairs in Massachusetts have been diverted because the state has failed to pass tougher drunken driving laws. Some changes have been made - lowering the blood alcohol level at which a driver can be presumed drunk and letting judges look at convictions more than a decade ago in sentencing drunken drivers. Extend license suspensions for repeat offenders from one year to 18 months, and bar them from getting hardship licenses from the Registry of Motor Vehicles for at least a year. Make drug and alcohol testing, along with treatment, a mandatory condition of probation for repeat offenders. Require offenders with hardship licenses to install ignition locking devices on their cars. Impose a mandatory sentence of at least 60 days for drunken drivers with a child 14 or under in their car. Such ads by lawyers are the kiss of death as far as Mothers Against Drunk Driving in Massachusetts is concerned. “They are feeding the denial of the drinking driver, apathy and denial which is already enormous,” said Barbara Harrington, executive director of the group. She said few lawyers ever talk about treatment for their clients. Norfolk County District Attorney William Keating and Plymouth County District Attorney Timothy Cruz declined to discuss the arguments or practices of lawyers who make a career of defending drivers arrested for drinking too much. Massachusetts has lagged behind the rest of the nation when it comes to adopting stricter drunken driving laws. Last year, the Legislature passed a “lifetime look-back” law, which puts a defendant’s entire record, rather than just the past 10 years, into play for prosecution and sentencing purposes. And in 2003, Massachusetts became the last state to pass a law allowing judges and juries to presume that any driver with a blood alcohol level of .08 percent or higher is drunk. Yet $9 million in federal road construction money could be lost if even stricter drunken driving laws are not on the books by Oct. 1. Despite tougher measures lawyers say drunken driving cases can still be won, and drivers actually help themselves by refusing to take field sobriety or breath tests. “If the question of alcohol comes up, a driver shouldn’t answer any questions or take any field sobriety or breath tests,” said Jones, a member of the board of regents of the Alabama-based National College of DUI Defense, an organization that certifies lawyers specializing in drunken driving cases. Lawyers find plenty of wiggle room even when clients have flunked breath or field sobriety tests. Jones uses expert witnesses extensively. Sometimes they can convince a judge or jury that a sobriety test did not follow National Highway and Transportation Administration guidelines. “They are very rarely given and graded according to guidelines,” Jones said. “Once a jury finds out that completely sober individuals have failed field sobriety tests, you call into question the decision to arrest, or at least whether a defendant can be found guilty beyond a reasonable doubt,” Jones said. Making the call on whether to ask for a trial by jury or go before a judge is important to lawyers practicing in this area. “People are more concerned about drunken driving today and that reflects in the jury pool,” said Quincy attorney Jeffrey LaPointe. Even so, Lapointe most often recommends jury trials for his clients. “Judges have probably seen or heard most defenses hundreds of times, and their natural inclination is to say, ‘I’ve heard that before.’ You won’t get that from a jury,” he said. While drunken driving cases are not his specialty, LaPointe takes on about 20 a year. He said his approach is to discredit the prosecution’s case without being confrontational with police witnesses. “I say to a jury look, the police officer is just doing his job. He may have smelled alcohol, but did he meet the standard the jury should consider for making an arrest? Robert Sears may be reached by clicking here.